The Raymond Group is an owner of a drywall milling machine in each of our office locations. This revolutionary manufacturing system makes creating intricate shapes and assemblies from drywall much more affordable and cost effective. Originally created for the need of architecturally demanding projects, today The Raymond Group uses these strategically located machines to help provide a safer, timelier, cost effective, less wasteful product for each of our projects where repetition or high design is required. 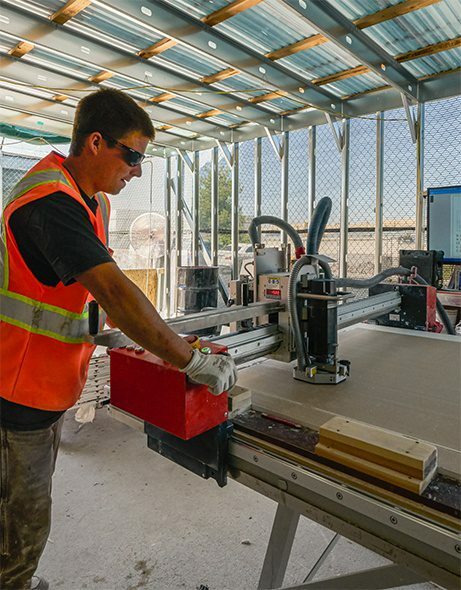 Prefabricate drywall components such as soffits, corners, and specialty items offsite. Increase the quality of installed drywall. Reduce the time consuming and messy operations of corner bead and taping.